All the benefit of men’s compression shorts with added space and protection for your essentials. North Moore shorts have two integral water-resistant pockets to keep your keys, phone, cash, and cards secure and sweat-free. Dimensions: 10" x 10" x 0.5"
Weight: Small: 0.26 lb. ; Medium: 0.26 lb. ; Large: 0.29 lb. ; XL: 0.34 lb. ; XXL: 0.39 lb. Shirley -- these ARE under shorts for workout clothes. You should not be surprised they are tight. I sent these to my athletic son who has Type 1 Diabetes. 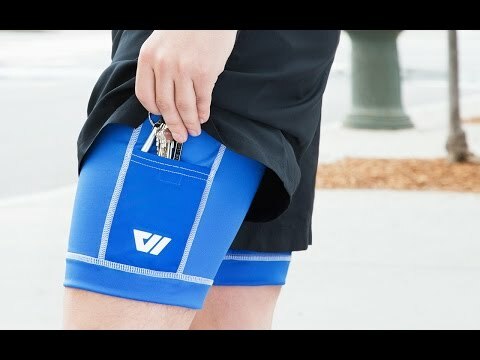 He reports the two pockets work well to carry his phone and monitor for a run. Easy to carry a key without it banging around a pocket. These are my everyday compression short for running now. While these shorts are technically 9" from mid crotch to hem, they are somehow much shorter than I expected. I am female, 100# and 5' so I bought size small. They end at mid thigh on me. I would have preferred they reach almost to my knees. Some would be delighted that the Velcro fastener on the smaller of the two pockets is very hard to open. Since I wanted to store my tissues there, I was not happy. It is almost impossible to open with one hand. The larger pocket is ideal for my iPod or XM radio. WOLACO’s Made in the USA shorts go beyond other men’s compression shorts with snug, integral pockets. Keep your essentials secure and sweat-free when you work out. One pocket can hold your phone, and the other cash, your ID, or keys. Maker Terry White is a former Harvard lacrosse player. He loved running in his NYC neighborhood, but there was nowhere to put his keys and phone. The keys-in-the-sock move wasn’t comfortable. And pockets on loose-fitting shorts left his phone bouncing around and drenched in sweat. So Terry founded WOLACO—Way Of Life Athletics Company—and designed the North Moore short for everyday athletes like him. No need to choose between leaving your must-haves behind or suffering with added bulk or bouncing. These compression shorts keep your items on-hand and protected, even on the sweatiest run.